Starting a new business is exciting, and a challenging task. Having a great plan and an amazing idea is not enough. You need to have organizational skills and flexible thinking to adjust to the evolving environment. Many people start a business with the hope of making all the right decisions, making money and running business successfully. However, you can avoid falling in a deadlock by understanding how to run a successful small business. 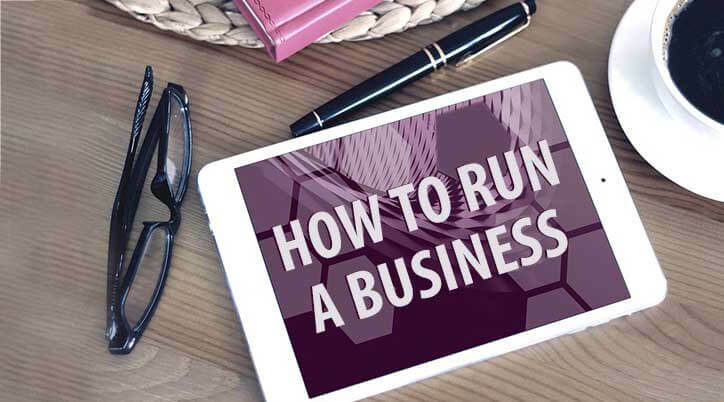 Check out our step-wise guide on how to run a business. It is important to choose the right business location. However, it requires planning and proper analysis. Visiting the location and simply evaluating the situation in one visit is not possible.However proper research to analyze the kind of customers that can be attracted to your product/service in that particular area is also necessary. The value of the business should also be calculated in terms of competitors. There is no point of entering in to a market that already has too many competitors, as it will automatically reduce the value and increase customer retention efforts. The goal of every business owner is to make profits or at least break-even (no profit no loss) in one or two years. To achieve this, you should calculate the expenses beforehand to evaluate how much you need to earn to break-even. Expenses can include everything from the money spent on infrastructure to hiring employees. Evaluating the expenses in advance helps business owners to manage his own contribution wisely. Making your passion your profession is the most exciting journey. But, how will you run a business without a plan? Everything requires planning and something as important and big as setting up a business needs an appropriate business plan. In the plan, you need to cover the break-even analysis discussed above, monitor the cash-flow cycle regularly, and then identify the requirement of money you will need for investment as well as day to day activities. Before starting a business you first need to analyze the total amount of investment required and the sources of funds available. Loans can be availed form different financial institutions as and when required, still you need to assure banks/FI’s that you are able to raise initial investment or margin money. A good business plan helps the entrepreneurs to focus on the specific steps required to make their business ideas succeed, and to achieve both short-term and long-term objectives. Quality of the product or service is an important aspect which has to be considered in satisfying your customers and retaining their loyalty so they continue to buy from you in the future. Quality products make an important contribution to long-term revenue and profitability. They also help you to get competitive prices for your product/service in market. Every business needs marketing. There is practically nothing that you can’t market on social media channels or through offline marketing. You can promote your products on various digital channels It only requires a some research on what and how your competitors are promoting in order to present yourself in a unique manner. Competition encourages business owners to improve and provide the best services. Identify the competitors, gather necessary information, analyze their strengths and weaknesses etc. Also, observe where your competitor has gone wrong in order to avoid same mistakes. Whenever you have to make an important business decision, always calculate the risks first. Only looking at the rewards, can lead to a series of issues. Know the risks of decisions in relevance to the rewards. The rewards section should always weigh more than risks. If you are putting money at risk, you should get great rewards in return. Maintaining financial records is important in any business. Knowing from the inflow and outflow of your business funds is not only essential for taxes but it also helps you evaluate the health of your business. At any given point, if your accounts are accurate, you can know if you are in a position to make certain business decisions. Good customer relations always lead to a high retention rate. If you value your customers, help them with issues, and try to offer quality service each time, then they will become your loyal customers and will also recommend you to other people. Today, creativity and innovation is the heart of every business. From a small retail owner to a highly funded startup, everyone needs to harbour creativity. Users like things that are different from the usual products. So, always encourage your employees to come with creative ideas. Managing human resources is not an easy task. Everything from hiring, retaining, and maintaining employees costs money. At the time of hiring, closely scrutinize the skills and talents of the candidate in order to develop a healthy long-term relationship with the organization. Just because you bond with someone well personally, doesn’t mean that you should partner with them professionally. Don’t rush into a partnership without knowing the working style of the other person. Knowing how to run a business and making it successful is a skill not everybody has. Moreover, partnering with someone directly means that you won’t have full control over your business. Your business won’t start making profits in a week. It may take months and even one or two years hence you need to be prepared for it from the beginning. Getting impatient or discouraged will only reduce your chances of setting up a stable business. You need to work hard and maintain uniformity/continuity which will result positively. Always remember the goal which you have set for your business. Of course, decent monetary compensation is the prime reason but most people have a secondary motive too. Focus on your motives which might be to become self –reliant, or save for retirement income etc. For instance, if you thought of doing a business because you wanted stability in life, then make it a point to save or invest some part of your earning. It is a common habit amongst business owners to take the ownership of every activity. Initially, this may be possible, but in the long run, you need to delegate few responsibilities so that you can think of expansion . The market right now is evolving at a fast pace. What might have been the trend three months back may be fading today. Adjusting to evolving trends and market situation is necessary to grab opportunities. Keep an open mind and adapt quickly to change. Starting your own venture is an on-going process where you keep learning. Even after evaluating every aspect of how to run a successful small business or analysing possible elements on how to grow your business, you can’t figure out many aspects in advance. There are a lot of responsibilities and managing all these simultaneously is the key to move towards success.